The eighth film in the epic Star Wars saga, The Last Jedi, has given us more food for thought in the Cakes by Robin kitchen for our fabulous Star Wars themed birthday cakes. The cool fight scene in the Red Room is tempting us to the dark side and is calling for our Red Velvet cake. So whatever character or scene you’d like on the outside, why not make the inside a galactic surprise too. Whatever you think of the latest Star Wars movie, (reviews are mixed, but we are suckers for anything Star Wars related so it gets the thumbs up from us), a Star Wars birthday cake is a must for any big fan. No force can stop us when it comes to creating a Star Wars cake of epic proportions, so we are willing to take up the lightsaber and defend to the hilt. With force lightning protecting our team in the kitchen, we can ramp up the cake power and create any Star Wars character to perfection in cake form to whatever proportions you wish. Every Star Wars movie has brought its own galactic explosion of light and dark, life and death. 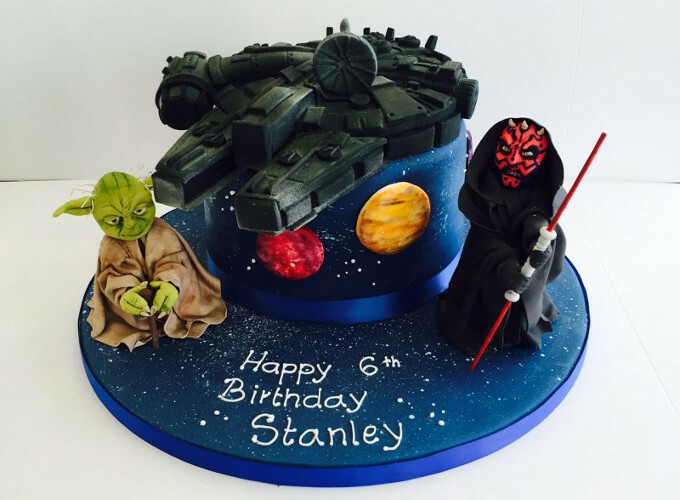 They have all inspired our love of everything Star Wars and it has been a brilliant journey bringing new characters to life in cake form along the way. Our BB8 robot cookies and cakes are a big hit, as are our Star Wars dessert tables incorporating a handful of favourite characters and critters, from human forms to aliens and robots. Who wouldn’t love an epic R2-D2 cake, or a replica Darth Vader mask. 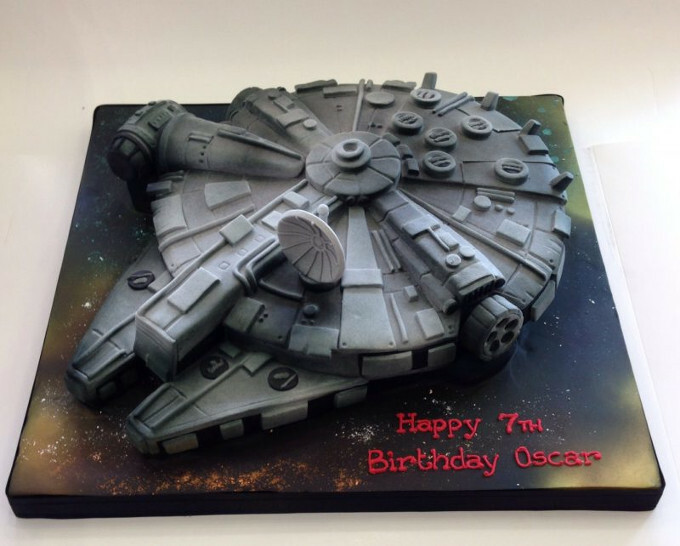 A cake replica of the Millennium Falcon is one of the coolest cakes a starship fan can get. Don’t be afraid, give us a challenge. We are sure we could get the wrinkles of Supreme Leader Snoke in all the right places in a cake replica, or bring you a whole set of adorable Porg cookies. Whatever your secret Star Wars passion, take your dreams to the party with a cake in your favourite film form. From the phenomenal original Star Wars to The Empire Strikes Back, Return of the Jedi and beyond, there’s a favourite character waiting to be baked! Whether you choose a pretty Princess Leia cake or a cake of the goggle-eyed trout, ‘it’s a trap’, Admiral Ackbar, we’ll do everything we can to make your birthday cake as lifelike as possible. Character-wise there are just too many greats to mention, but it wouldn’t be cool if we didn’t pay homage to Luke Skywalker, Han Solo, Yoda, Chewbacca and Obi-Wan Kenobi, not to forget Darth Maul (great cake inspiration), C-3PO, Rey and Kylo Ren. In fact, aargh, there are just too many to mention. If you have a favourite you’d like to see in cake form, get in touch with our fabulously creative team today. May the cake force be with you!